“I was very pleased with the service and as far as I can tell at this point the quality of the workmanship. I particularly would like to commend Sara Atkinson for her professionalism and personality. Too often staff in roles similar to her’s know their jobs, but lack the skills to make it a comfortable and not unpleasant process for the customer. As the face of Buerkle in my case, I really appreciated her. We look forward to continuing our relationship with Buerkle on the maintenance side in the future.” -Brad L.
“I was so impressed with the respect I was given when I had my Honda Civic repaired at this dealership. They did a fabulous job !! They were honest and upfront with me in what needed to be done. My car looks like new again. I would give them a ’10’ and recommend them to anyone who needs any kind of body work done on their car. THANK YOU! ☺” -Pat K.
To find the best auto body shop for you, you’ll want to look at their history, customer service satisfaction, and experience working with your type of repair needs. Experience: Auto body repair is a demanding field. It takes many years to master the needed skills and build a body shop team that works smoothly and easily together. Know however that auto body repair is not as specialized by make of vehicle as auto repair is. A good body shop can indeed repair a wide variety of makes, whereas an auto repair shop might be best off turning away a BMW if they do not typically work on them. History: A body shop with a longstanding history is a good sign they have the experience needed to understand their craft and have invested in their shop and their customers. Customer satisfaction: Look for reviews on sites like Yelp, CarWise and Google that indicate high satisfaction. Dedication to quality: True auto body repair is an art and a skill learned through long practice. While there are shortcuts that can be taken to speed up work, you don’t want your body repairman covering up rust instead of telling you about it, or straightening your bent frame to 98.5% straight instead of 100% – you’ll end up with bigger issues later on. You’ll likely receive a different number from every body shop or collision center you ask. What you should keep in mind is that, as with many other things, in general you’ll get what you pay for. That’s not to say that the most expensive is always the best — but you should be cautious of a quote that seems too good to be true. You should also be cautious of “guaranteed” online or phone estimates. Damage estimating is a skill in and of itself, and estimates may change on site when the body shop team sees your vehicle up close and is able to accurately assess the full extent of the damage. 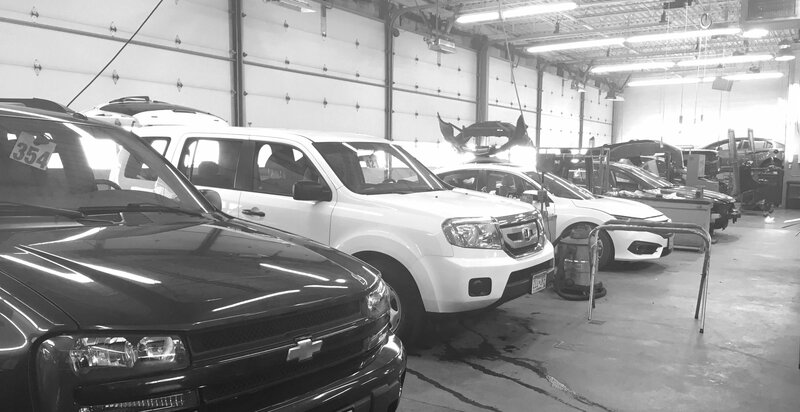 While this advice applies to every auto body shop, we are proud to offer auto body and collision repair services in St Paul, Minnesota for over 60 years and encourage you to take a look at our hundreds of customer reviews on carwise.com!